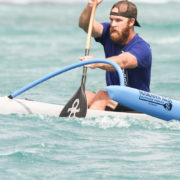 The Ozone Gemini outrigger canoe is the newest OC2 on the market and is designed by Kai Bartlett. Like the Ares it has incredible control when surfing the largest waves and is able to link waves with ease. It also has really nice glide in the flats and is great for inland lakes and rivers. The speed of the Gemini exceeds many marathon racing canoes and other watercraft. 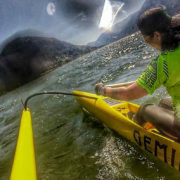 The Gemini is similar in design to the Ares but in a 2 person canoe. Here is what Ozone has to say about the Gemini. Meet the latest OC2 on the market, Gemini. On a flat day she glides and cuts through glass with a sharp entry and long waterline. On a big day, the volume is just right to keep her floaty and pushing through the trough and connecting to another bump. 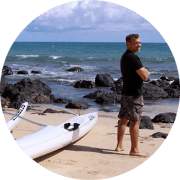 If you love the feeling of the Kai Wa’a OC1 but want to share the experience with a friend or family member, the Gemini will open doors to new adventures on the water.